Despite the initial excitement for the incline railway, its revenue expectations were never met. Even with the continued use by both businesses and pedestrians, financial threats to the life of the railway were a constant presence. 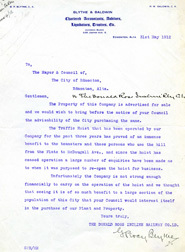 With construction and operation costs higher than anticipated, in January of 1909, the Edmonton Incline Railway Company requested the City’s help to continue the hoist’s operation. However, after a report given by the City Auditor on the poor financial condition of the Railway, the City refused. At this point, the company had to find an alternative plan. On February 2, 1909, the company went into liquidation. By early April 1909 the company was reorganized and opened for business under a new name: Donald Ross Incline Railway Company Ltd. Despite the restructuring, the railway’s financial trouble continued. The Company requested and received approval from the City to adjust the agreement allowing seasonal closures from November 1 to April 1. The first winter closure occurred between 1910 and 1911, and the second between 1911 and 1912. 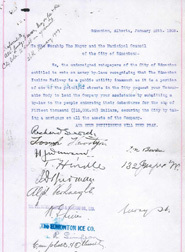 Before opening in March, 1912 the City declared the hoist unsafe. Rather than pay to remedy the defects, the company chose to sell the operation. The Donald Ross Incline Railway Company encouraged the City to take up the operation, as they felt it still provided an important service to Edmonton’s citizens, however the City declined. Likely influenced by the City disapproval of the safety and condition of the railway machinery and increasing competition with the soon-to-open High Level Bridge, no one came forward with an interest in purchasing the railway. After the railway was closed the track was pulled up. 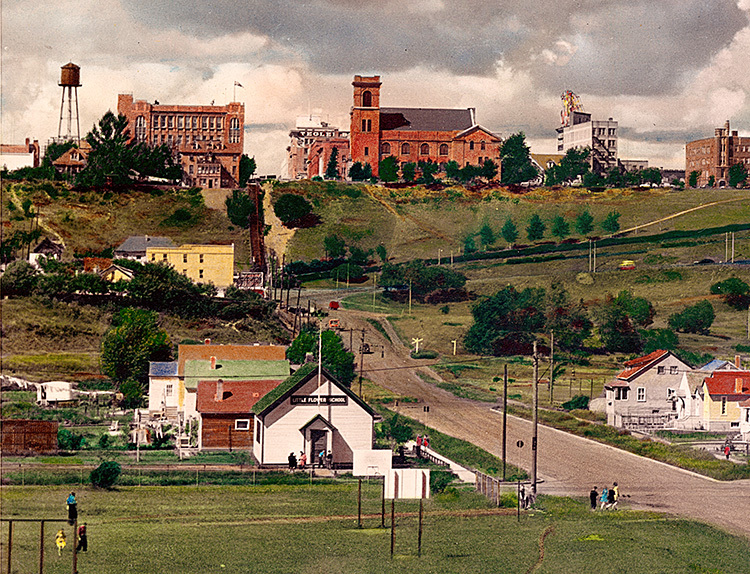 For many years its location could be seen as a scar on the hill, until the Chateau Lacombe was built in the mid-1960s. 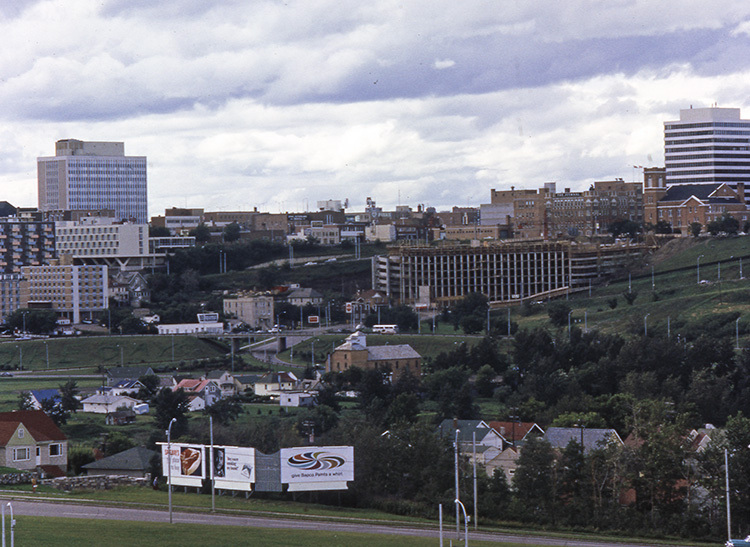 This photo shows the Edmonton skyline in Spring of 2015. On June 23, 2015, City Council approved the Mechanized River Valley Access project to ensure that the river valley will be more accessible to people of all ages and abilities. 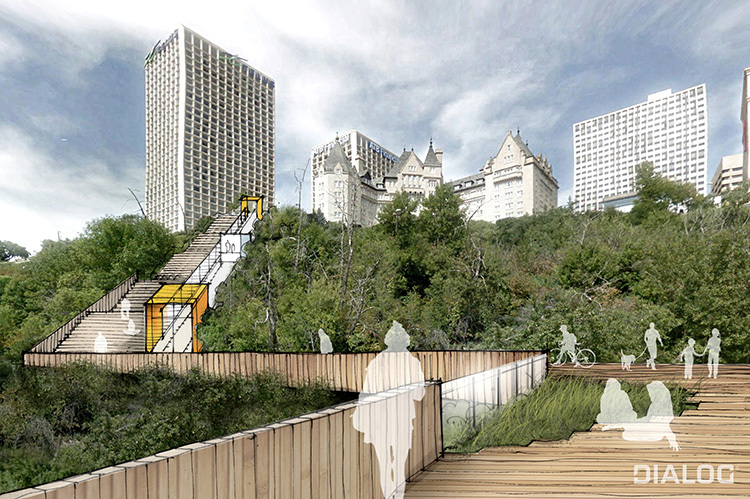 This project will see a new funicular railway built one block east of the original Edmonton Incline Railway. After more than 100 years Edmontonians will once again be able to ride an incline railway! A 2015 design drawing of the new Edmonton funicular.